My second day at the ASCD Conference in Chicago brought another good variety of interactions and learning opportunities. (Read about Day 1 highlights here). I started the day at the ASCD Forum, which gave ASCD leadership a chance to engage with conference attendees both live and virtual around discussions of teacher and principal effectiveness and how to assess it. The forum was organized around a series of questions, each answered in brief from a selected teacher and principal before opening the floor to participant responses. Among those responding were individuals coming from administration, research, and teacher training. I wish we could have had some testing and value-added advocates participating or at least listening, because it’s time for them to recognize how far off course they are, how out of step with educational research and leadership. An assistant superintendent from Utah put it bluntly when she commented that test-based evaluation is not just a bit flawed, but actually counterproductive in teacher evaluation and improvement. “The system is going to implode,” she remarked, and no one seemed to disagree at all. The same event included observations that should be troubling to anyone concerned about the training and development of new teachers: with the use of test scores in evaluations, teachers are increasingly reluctant to take on student teachers, as the students’ test scores will be attributed to the mentor teacher regardless of the student teacher’s effectiveness. I actually heard this observation multiple times yesterday in unrelated conversations, discussing different locations. The highlight of the forum, for me, was principal Torian White, who began with the observation that when it comes to policies around the measurement of teacher and principal effectiveness, “The most informed are often the least consulted.” White also made a plea for the inclusion of more qualitative measures. “Data is king,” he remarked, but qualitative information is what gives the data any meaning. I hope that ASCD continues the idea of this forum at future conferences, and even promotes and expands it. Next up was the keynote address by Maya Angelou, which I wrote about yesterday. 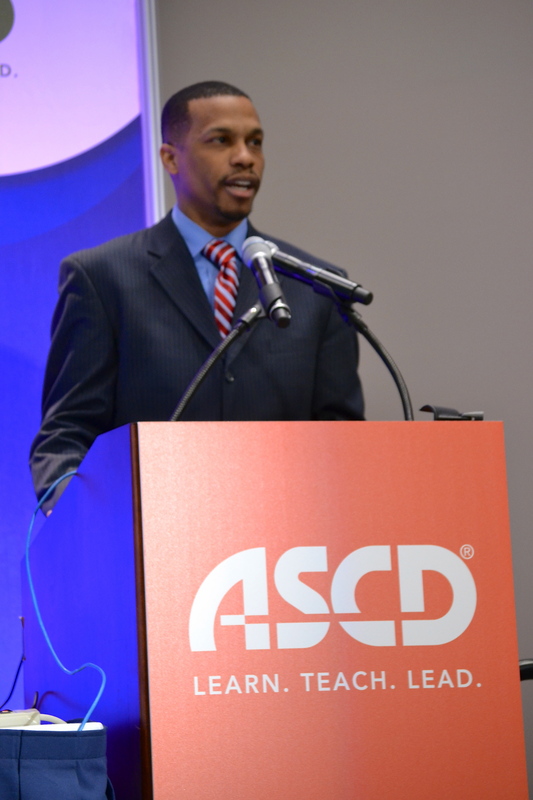 From there, I went to a lunch where I was able to speak to some ASCD authors about their books. I wonder if, ten, fifteen, twenty years ago, there were as many books and conference sessions about teacher burnout and the toxicity developing in education. I didn’t attend any of those sessions, but I did talk to two authors about that topic. Allen Mendler and I chatted briefly about his book When Teaching Gets Tough. The book came out almost a year ago, and he remarked that he’s heard from many readers that the book is resonating in the field right now. I also spoke with Robyn Jackson, author of Never Work Harder Than Your Students, and Other Principles of Great Teaching. Jackson was an engaging conversationalist, who shared some insights from her travels and observations in various schools. The trend she seems to find most worrisome is that everyone is pursuing “teaching quality” by trying to find the right system, the right strategies, and then implementing those without regard for the variabilities in people and schools. Good teaching actually looks and feels different depending on the teacher and the classroom, and Jackson believes that its more important to identify essential principles of healthy schools and good teaching, and then use those principles to select from a variety of strategies that build on strengths. Students pick up on what’s happening when teachers are trying to fit themselves into an uncomfortable mould. “You can ‘PD’ a teacher out of effectiveness,” Jackson remarked. A teacher who can be passionate and authentic has greater chances of building the relationships that are essential in a thriving classroom. Such comments should not be construed as license to do whatever we want, however we want to do it; but a focus on principles rather than strategies increases the odds that we’ll be having the right conversations and make the right choices for teachers and students. I ended the day hearing about curriculum mapping and the Common Core, from presenters Heidi Hays Jacobs, Ann Johnson, Marie Alcock. Once again, the question of approach was key, as Jacobs noted, “If you go at this [CCSS transition] as compliance – game over. This is a chance to improve your schools.” Can Common Core standards be a vehicle for school improvement? I believe it’s possible, but the recent history of how we’ve used standards and assessment at the policy level suggests that there is reason to be deeply concerned. Hi David, thanks for attending the ASCD Forum session! If you’re interested in blogging on ASCD EDge about educator effectiveness to continue the forum conversation, let me know! You had better believe there is reason to be concerned about CCSS. At the top of my list is the idea that ANY standards are appropriate for all children at any grade level flies in the face of all we know about child development. Then there are the added costs for all the new testing and materials required for the new standards. Beyond that, the fact that these were developed and are being implemented top down is an added concern. I agree with Robert’s initial statement, but I am glad ASCD is taking a balanced approach at least at the conference level. As a teacher at a school that is piloting testing, although I am not directly involved, I have heard plenty of reasons to be concerned. The amount of testing students will be subjected to in Math and Language Arts will go beyond what is given now. It seems that those making the decisions on testing are not considering the needs of students when it comes to the amount of time testing. Moreover, if you are in California your students may be subjected to both the CST and CCSS tests next year. My hope that ASCD will play an active role in promoting the ongoing conversation about teacher quality and evaluation. An interesting but quite valid point on those teachers that do not accept a student teacher because the impact it has on scores. I can definitely attest to the fact that having some student teachers can have a profound impact on two classes scores based on my own personal experience. Fortunately I do not teach nor do I teach a subject (history) that is under the magnifying glass such as language arts or math.